Google has recently acquired wireless startup Alpental Technologies and video advertising company mDialog to boost up its own unit DoubleClick.It seems that Google is eager to improve its wireless technology and offer more high quality video options to its advertisers. Google’s latest acquisitions deals have not been publicly revealed. 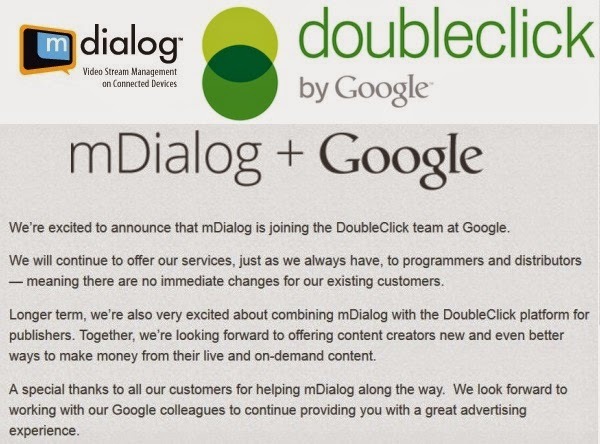 mDialog will be joining the DoubleClick team at Google and will continue to offer its services to programmers and distributors. As per Google, this acquisition proves its commitment to offering more ways for publishers to monetize live, linear and on-demand video content across all screens. From several internet sources it is revealed that the purchase of Alpental may be part of the $1-billion commitment Google made earlier this month to bring Internet to remote areas of the globe. It is obvious that Alpental will play an active role in Project Loon, the technology giant’s balloon-powered Internet endeavor to bring the two-thirds of the world’s population with no connection online. Lets see how it goes and how it helps in Google's future ventures. Copyright © 2010-2018 Poketors | The content of this website is copyrighted and may not be reproduced on other websites.| Email us at : admin@poketors.com.